Is Abercrombie & Fitch the next retailer to die? Abercrombie & Fitch has turned into a teenage wasteland at the mall. The once popular apparel retailer is now in serious trouble. Sales have plunged for the past few years as the company's clothing has fallen out of fashion. Many would-be customers weren't even alive when Abercrombie & Fitch was at the height of its popularity. "Summer Girls" -- the song by one-hit wonder LFO which mentioned "girls that wear Abercrombie and Fitch" -- came out 16 years ago. Today, teens aren't as interested in wearing clothes with the A&F and Hollister logos on them anymore. 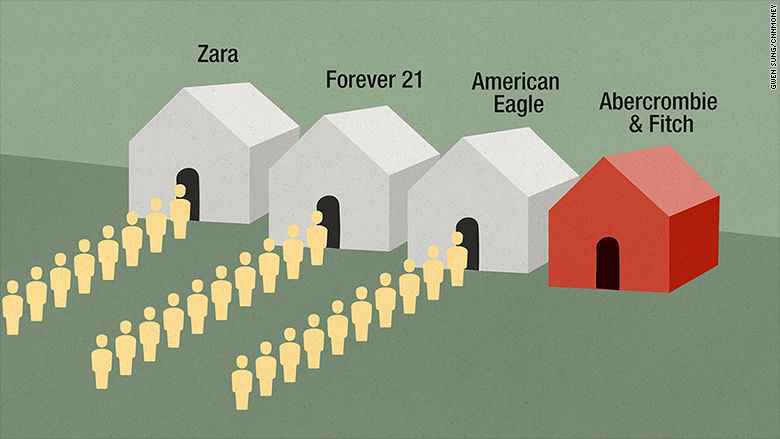 They want more affordable "fast fashion" from the likes of Forever 21, H&M, Zara and Uniqlo. It's gotten so bad that Abercrombie & Fitch's CFO said during a conference call with analysts Wednesday that it was looking to sell the corporate jet used by its former CEO Mike Jeffries. The troubled CEO: Jeffries, who left Abercrombie & Fitch (ANF) in December, was a polarizing figure that arguably hurt the company's image more than he helped it over the past few years. He was criticized for comments he made about only wanting "cool, good-looking people" to wear his company's clothes. It wasn't until late 2013 before the company finally began to offer plus sizes. Jeffries was also attacked for having scantily-clad models in many of its catalogs and advertisements. The Gulfstream that is now for sale has become a poster child for corporate excess. According to documents in an age discrimination lawsuit against the company by an ex-pilot that was filed a few years ago, Jeffries had a bizarre aircraft manual that listed dress requirements for male models who worked on the plane as well as a boarding procedure for his dogs. Abercrombie & Fitch is searching for a new CEO. But so far, it isn't doing any better without Jeffries. The retailer said Wednesday that its same-store sales in the fourth quarter fell 10%. The stock is down 30% this year and is trading at its lowest levels since early 2009. Searching for a turnaround: The company clearly needs to turn things around. And it may be hard to do so. Other teen-oriented/mall-based retailers Wet Seal (WTSLQ), Deb Shop and Delia's recently filed for bankruptcy. American Apparel (APP) and Aeropostale (ARO) are floundering as well. And the pain in this group may not be over yet. After Jeffries abruptly left the company, Wunderlich Securities analyst Eric Beder wrote in a report that "the teen segment will remain in flux and decline for the foreseeable future until the group reaches some sort of equilibrium." Beder added that Abercrombie & Fitch has "a broken business model." Still, there may be some faint signs of hope for Abercrombie & Fitch. It appears to have some wiggle room financially. It still has $530 million in cash. And it has been burning through that slowly. It finished 2013 with $600 million and 2012 with $643.5 million. This is faint praise though. 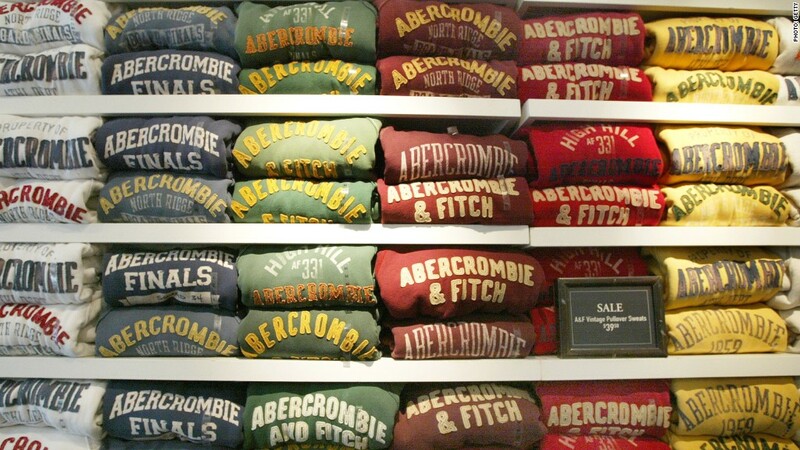 The best outcome for Abercrombie & Ftich might be for the company to get taken over. There were rumors several years ago that the company could be a good fit for a private equity firm but that chatter has grown quieter as sales have slumped. The other plus is that the company seems to recognize that it has to cut back on its logo-centric apparel. That's a strategy that does seem to be helping to stabilize American Eagle Outfitters (AEO). American Eagle reported better-than-expected results on Wednesday, sending its stock soaring 8%. Shares are up 20% so far this year. American Eagle still isn't necessarily healthy. It merely reported that its same-store sales were flat. But it looks like it's stopped the bleeding. 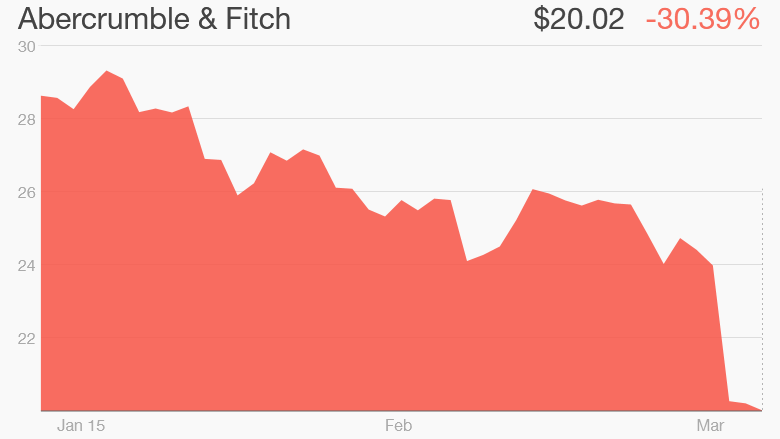 Abercrombie & Fitch investors would probably be tickled pink if the company was able to post flat sales. That won't make it "cool" again though.